[update: there are not many places left, there’s 150 places, so if you’re interested in science and the communication of science, particularly with the internet as a medium, then get along. At £10, it’s a bargain]. WHEN I was part of the huge legion that didn’t go out and buy the newly released iPhone, but instead bought an iTouch, I revelled in my uniqueness, my individuality, my un-erring sense of fashion. Pah, anyone can by an iPhone I thought; I wanted the technology that was almost completely locked, with under-developed software and little use beyond a few snazzy features. One such snazzy feature was embodied in an early app called ‘Koi Pond’, where the iTouch miraculously became a simulation Koi Pond. I could peer into the magical device and the little Koi swimming amongst the lillies; I could interact with them, ripple the surface. It was really cool for a whole 5 minutes. Then it was boring. This all changed soon enough, with software updates, the opening up of the OS platform to third party developers and general usability. I was quids in; I saw the development coming and made the right choice. At the end of last week, Apple finally released the much awaited OS 3.0 for iPhone (for free) and iTouch (at cost, of course). I updated on Sunday morning and was pleasantly enjoying the cut and paste (never was cut and paste seen as such a novelty in recent times!) and the Spotlight function allowing me to search my whole iTouch for keywords. Yes, this fun lasted all of about 2 hours. Upon arriving at a friend’s house on Sunday afternoon, I visited their pond to look for fish. The iTouch slipped from my unsecured shirt pocket into the pond, sinking into the mirk at the bottom. 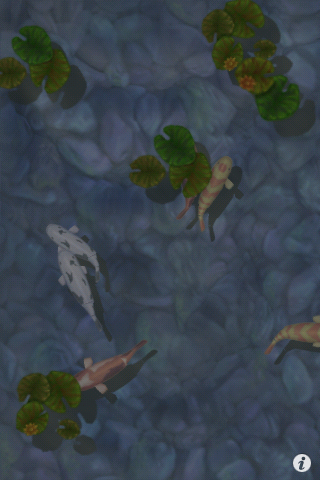 My digital Koi had had the last laugh as they joined their brethren, before fizzling out never to be seen again.